Retravision’s website is promoting the giveaway. Retravision has launched a pre-Christmas consumer promotion today, counting down until Christmas Eve, offering shoppers more than $42,000 worth of prizes across 22 daily prize draws. The 22 Days of Christmas Giveaways promotion is open to residents of Western Australia, Queensland and South Australia only (the states where Retravision has bricks and mortar stores) with consumers required to shop in-store or online to enter. Consumers can make any purchase and then enter the draw by filling in an online form with their purchase details. Retravision is kicking off the promotion today with a Fisher & Paykel 8kg WashSmart Top Load Washer and 5kg Electronic Sensing Dryer set, valued at RRP $1,478. Other prizes include Tefal, Sunbeam and De’Longhi small appliances, major appliances from Westinghouse, Electrolux, Haier and Dishlex and AV products from Palsonic and Panasonic. The competition is also being promoted through Retravision’s Facebook page — which now boasts more than 5,000 ‘likes’ — and will be spruiked on the retailer’s online store. 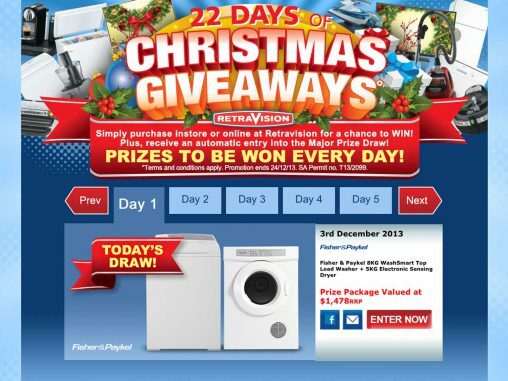 Details of the promotion, including daily prizes and full terms and conditions, can be found on Retravision’s website.